Hello Severn Wishes Followers! 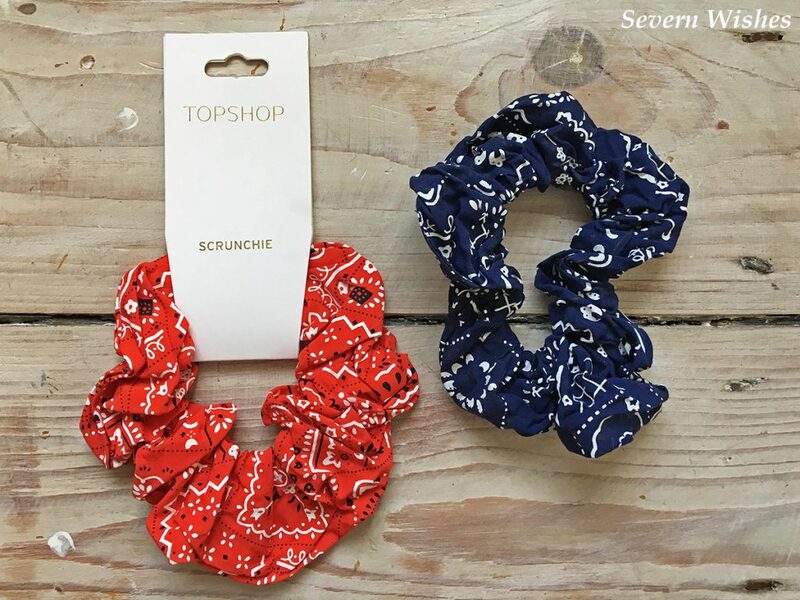 Welcome to my Topshop Scrunchies Review. Just a short review for the blog today from my recent Topshop purchases. I was after some new Scrunchies that would be strong enough to wear around the home but nice enough to wear out if I were to put my hair in a bun. I had seen some either online or in a magazine and I recalled they were from Topshop so I made it my first choice to look at the selection. I was pleasantly surprised by the variety and so got myself some. I bought two kinds, one red and one blue, I went for more vibrant colours instead of going safe like I would normally do. I really like the unusual pattern on them, and I love that there are no metals used so your hair won’t get damaged during their use . The Cost is £4.00 per Scrunchie and these two were sold individually. I wouldn’t normally spend that kind of money on hair accessories, but I really liked the uniqueness of them and these accessories seemed well made. Overall I think these are fashion forward and on trend pieces that can brighten up anybody’s hair accessories stash. The quality is good and I like the exciting patterns too. I purchased these at the end of May, and the blue one is now on sale, typical! I think if more get reduced I wouldn’t mind a few more of them, they are rather comfortable to wear in my hair and I feel they match a variety of items in my wardrobe as well. Thank you for reading this review today, and I hope you’re having a wonderful June so far. Here are the website link to the items I have purchased. This entry was posted in Accessories, Fashion, Fashion & Beauty, Hair Products, Reviews, Topshop by Sabrina. Bookmark the permalink. They look fab. £4 for a decent quality pretty scrunchie seems pretty reasonable to me. I’ll be popping in my local topshop on pay day. Thanks.